This Saturday we hosted an Easter play date for my niece and nephew, because I've been ill and the hubs is still hobbling we didn't quite go all out as we did for our valentines and Halloween play dates, but we still all had a great time. 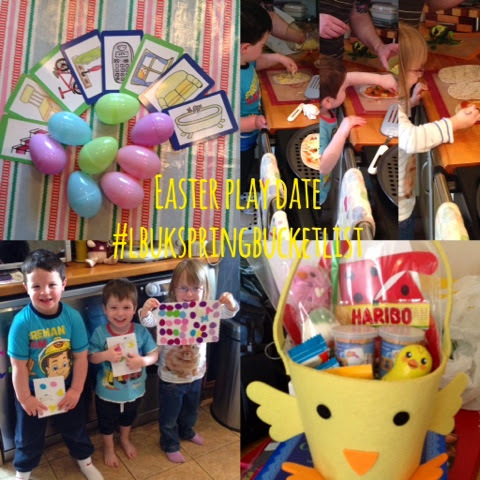 We did 3 activities, and my fabulous sister put together some amazing Easter basket goodie bags which we used as the treasure hunt prizes! First off we made Easter cards using some Easter foam stickers from hobbycraft, this saved lots of mess and proved to be quite a good, clean and easy activity. As always M (girl aged 4) could have sat sticking all day but both boys (my T aged 2.3 & J aged 3.8) were bored after searching through, finding a few stickers and sticking them on, my sister stretched this activity with them by making them search for their initials in the letter stickers, which entertained them for about another 5 mins!!!! 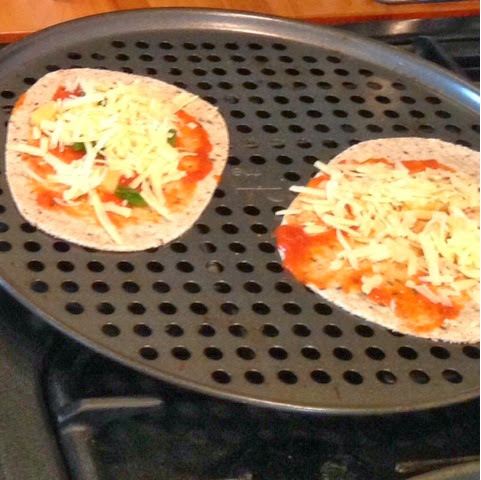 Then the hubs made Easter egg pizzas with them using Easter egg shaped tortillas that I'd cut out, I really wish I'd have got more photos but I just didn't think to be honest, I'm blaming this still lingering post viral virus thingy! Once lunch was over, they started asking for dessert - no surprises there as I usually have something for them, I told them that they had to do a treasure hunt to find Easter eggs hidden round the house and explained that there was a 'clue' with each egg, I set out 8 clues in all, round our small house to be honest the older 2 could quite easily have done more, they weren't really ready for the hunt to end until they were given their Easter baskets full of sweets and gifts. I purchased the gotrovo mini treasure hunt kit from created4kids.com I cannot praise this product and the company enough and used the picture cards for this treasure hunt, I love how it can be used time and time again and can't wait to use the different stages as T grows up. It was also super simple to set-up and clear away. This is the first activity to cross off of our spring bucket list. NOTE: I have, received no payment or freebies in return for this endorsement. When I find a product that really think is worth shouting about I like to share that information, that's all! Have a lovely day, Lx.